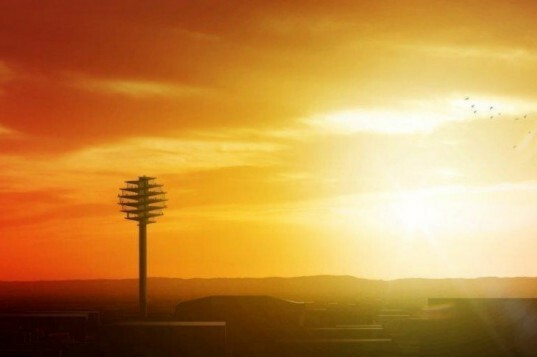 Apparently Phoenix isn't well-known enough, because developers want to put it on the map with a giant pin-shaped observation tower. Designed by BIG, the Pin is a 430 ft tower topped with a giant ball and spiraling exhibition and recreation space. Likely visible from space, the pin will let aliens and astronauts know where Phoenix is and visitors can enjoy unparalleled 360° views from its heights. 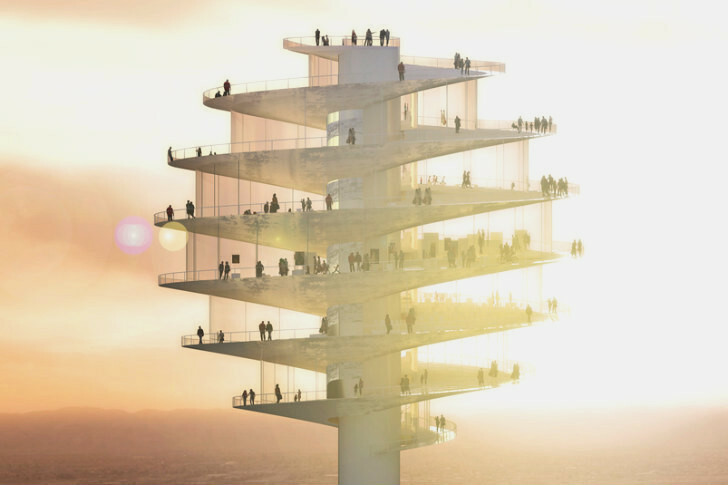 Lit up with LED lights at night, BIG plans for the Phoenix Observation Tower to serve as a working model of sustainable energy practices and will incorporate a blend of solar and other technologies. The Pin Phoenix Observation Tower is being developed by boutique real estate company Novawest and designed by Denmark-based BIG. Unlike many other big cities, Phoenix does not have an observation tower to draw visitors into its downtown. The pin will be located in the heart of the museums, convention center and the sports arenas. Rising 430 ft in the air, the Pin is composed of a concrete core topped with a spiral sphere. BIG’s design was inspired by the Guggenheim museum and is like a core sample removed from the building and placed on top of a tower. Visitors will enter the facility through the Base, which will serve as a public plaza offering shade, water features and a small amount of retail together with a subterranean queuing area. An elevator in the core will take the visitors up to the top of the sphere and then they walk down at their own pace. Inside the sphere, visitors can enjoy dynamic viewing and observation space, a terrace bar and café, a high-end restaurant, event space for catered events, a viewing gallery for special art and cultural exhibits and an evening lounge and nightclub. The Pin is definitely a distinctive landmark and will certainly place the city on the map. One can imagine though the analogies you can make regarding its shape – a golf ball on a tee, a giant mascara wand, or a huge map pin. Sustainability is said to be a large part of the design and will include energy efficient practices, LED lighting, and solar technologies. No word yet on construction timelines, but naming rights are still available, for which you can contact Novawest. The Pin Phoenix Observation Tower is being developed by boutique real estate company Novawest and designed by Denmark-based BIG. Unlike many other big cities, Phoenix does not have an observation tower to draw visitors into its downtown. The pin will be located in the heart of the museums, convention center and the sports arenas. Rising 430 ft in the air, the Pin is composed of a concrete core topped with a spiral sphere. BIG's design was inspired by the Guggenheim museum and is like a core sample removed from the building and placed on top of a tower. Visitors will enter the facility through the Base, which will serve as a public plaza offering shade, water features and a small amount of retail together with a subterranean queuing area. An elevator in the core will take the visitors up to the top of the sphere and then they walk down at their own pace. Inside the sphere, visitors can enjoy dynamic viewing and observation space, a terrace bar and café, a high-end restaurant, event space for catered events, a viewing gallery for special art and cultural exhibits and an evening lounge and nightclub. The Pin is definitely a distinctive landmark and will certainly place the city on the map. One can imagine though the analogies you can make regarding its shape - a golf ball on a tee, a giant mascara wand, or a huge map pin. Sustainability is said to be a large part of the design and will include energy efficient practices, LED lighting, and solar technologies. The spiral sphere silhouette of the PIn. No word yet on construction timelines, but naming rights are still available, for which you can contact Novawest.